Deer collisions along the highway through my hometown is really costly. Over one hundred deer get killed by vehicles every year in a stretch of road that is just over 10 miles long! Why? Because they migrate to the foot hills East of the road and then munch their way down toward the road eating alfalfa and orchard tree branches and suddenly find themselves on the edge of the road. Deer do what deer do best and that is continue to want more to eat. They look up and see more orchards on the other side of the road and so….clap, clap, clap…across the road they go! BLAM, BUMP, SLAM, SMEAR, BREAK, TINKLE, CUSS!!!! Another deer is killed and another car, truck, van, motorcycle or whatever is damaged. Another insurance claim made. And more costs incurred by you and I as well as the person who was insured (or not), because of the rate increases to cover the increasing cost of fixing broken vehicles. And that says nothing about the cost of that deer! They are a renewable resource here in the state of Utah, but why couldn’t a hunter have harvested it instead of it getting hit on the highway and left there to rot? Was it a pregnant doe? Probably. And so, two or more deer are actually dieing instead of just the one you see laying there. Sad. So, here is my idea, and anyone of you reading this can follow up on it and make yourselves millions of dollars, because wildlife being killed by vehicles is not just happening here on highway 89-91. It’s happening all over the world! Produce a motion sensing machine, (they already are out there), that is strong enough to read motion out to say 200 yards. Set two of these on either side of a pole. One to sense in one direction parallel down the road, the other to sense in the other direction. Each of these poles will have to have flashing yellow signs on top of them and when the sensor detects movement, the lights begin to flash and flash for say five minutes. If no more sensing is detected after five minutes the flashing stops. Place these poles every “whatever” yards apart down the sides of the roadways. I would suggest the sensors overlap in their sensing distance to make sure you have the entire roadway covered. Put them on both sides of the road way. Since most of these vehicle/animal collisions happen just at evening, during the night or first thing in the twilight of morning, the flashing lights would show up very nicely. As a motorist comes along and suddenly the lights begin to flash, they know there is something ahead that caused the detector to turn the lights on and they should respond by slowing the vehicle down. If they don’t they are dumb crapollas and deserve to get crashed! Sure these things would cost plenty to get implemented and many of them would need to be replaced during any given year, but think about how many crashes and dead animals will be avoided by these things! To me, it would be worth the expense. UDOT? UTAH DWR? Are you with me on this? 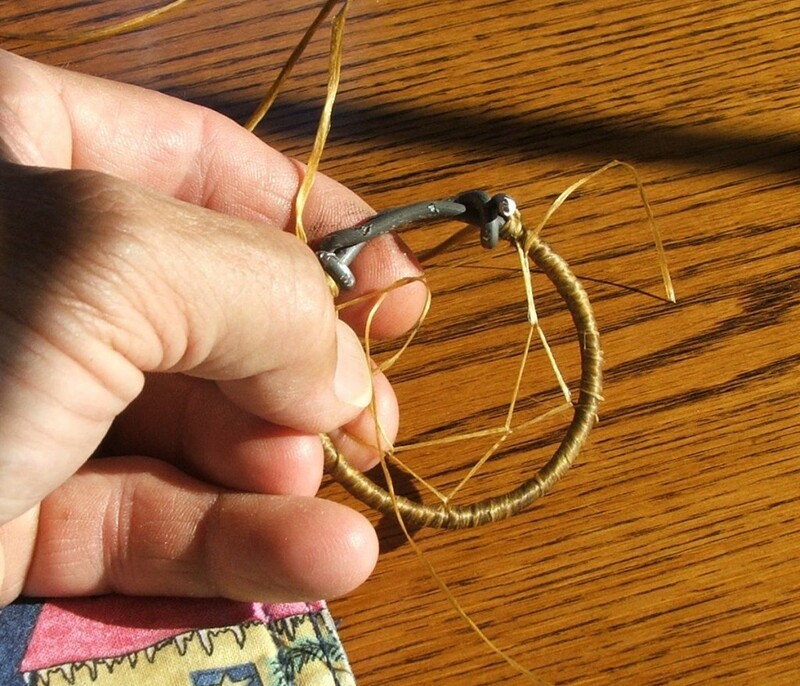 To make a dream catcher that will be your lucky charm on a Dream Hunt requires very few tools and not too much time. A perfect combination of things. It will cost you a little, maybe like two dollars to do, but that isn’t too bad either. In my little world of the Willow Creek Free Trappers (our mountain man groups name), the ring found on the end of a trap chain is a large part of our logo. And so, in order to make a dream catcher that is very special to a Willow Creek Free Trapper person, it makes perfect sense to use a trap ring to encircle that dream. A person could go out a buy a trap ring if they so choose, but not me! 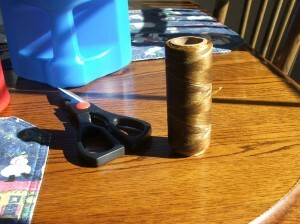 I scrounge up some soft fencing wire out of the shed. It is 14 gauge and just pliable enough to get the job done, while still being stiff enough to stand up to the test of time. So, with the wire found, we need a way to bend it in a nearly perfect circle. I found the bottom portion of an outdoor table umbrella for that part. 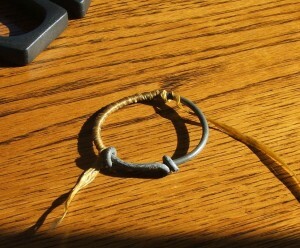 It measures about 2 1/2 inches in diameter (across). 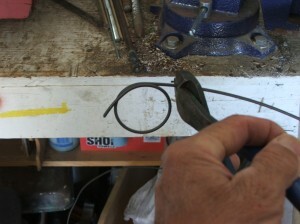 I have clamped this in my vise, but you don’t have to do it that way if you don’t have a vise. 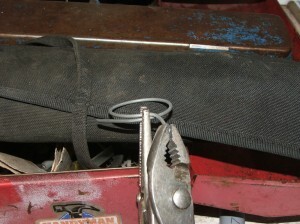 We will need a few tools to get this job done and one is a special type that can lock onto your wire and hold it tight. They are generally called vise grip pliers. Mine happen to be pointed. 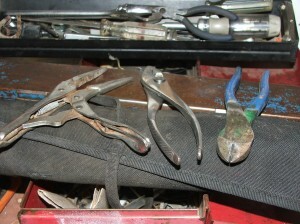 A second pair of pliers and some side cutting pliers. To begin making our trap ring just wrap the wire around the pipe and as you come around to the beginning point, keep the wire close to itself, side by side if you will. 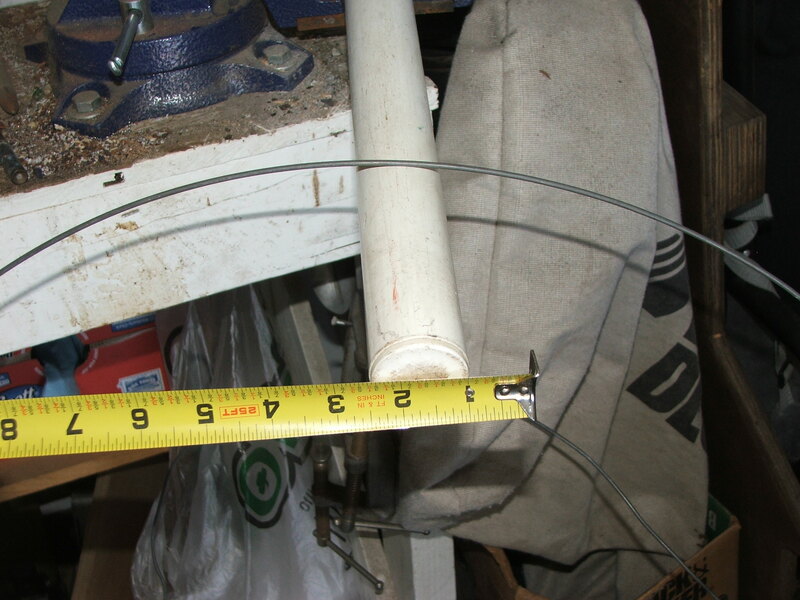 When you have made the full wrap around the pipe and have about two inches of wire out both sides of the mid point, take it off the pipe and clip it from the rest of the wire. 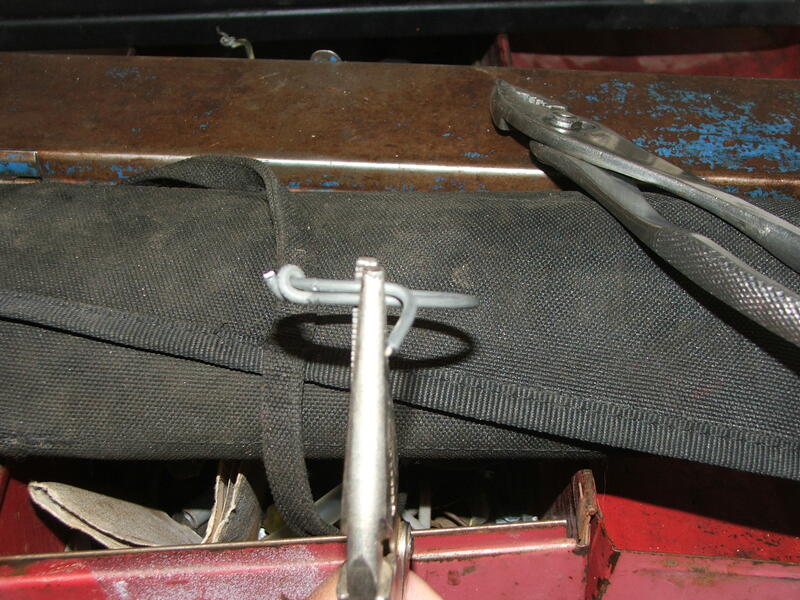 Grab up your locking pliers and take hold near the middle of where the wire is double. With the other pliers, take the end of the wire and bend it nearly straight up. Excellent! 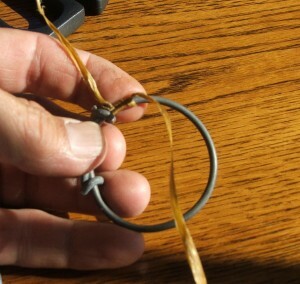 Now you are going to wrap that short piece of wire around the other part of the wire, all the way around if you can. WOW! You do good work! We will now do the same on the other end of the wire. So, turn things around and bend and twist. Once wrapped around you have successfully made a trap ring. 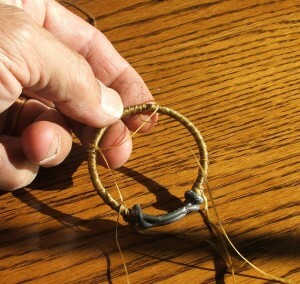 Now this ring is strong enough to hold most any critter caught in a trap #3 or smaller. But we aren’t going to use it for that. Remember? We are going to make us a dream catcher! Let’s go in and have ourselves a cold drink and think about the next step. But first, let’s clean up our work bench. Put those tools back exactly where you found them. A place for everything and everything in its place! Ok! It’s time to get real creative and make our finished dream catcher. 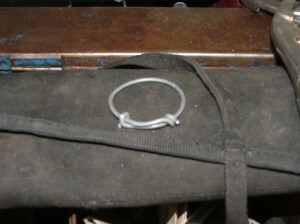 For this we will need some artificial sinew, string, twine, leather strap or whatever you want to put on your trap ring. 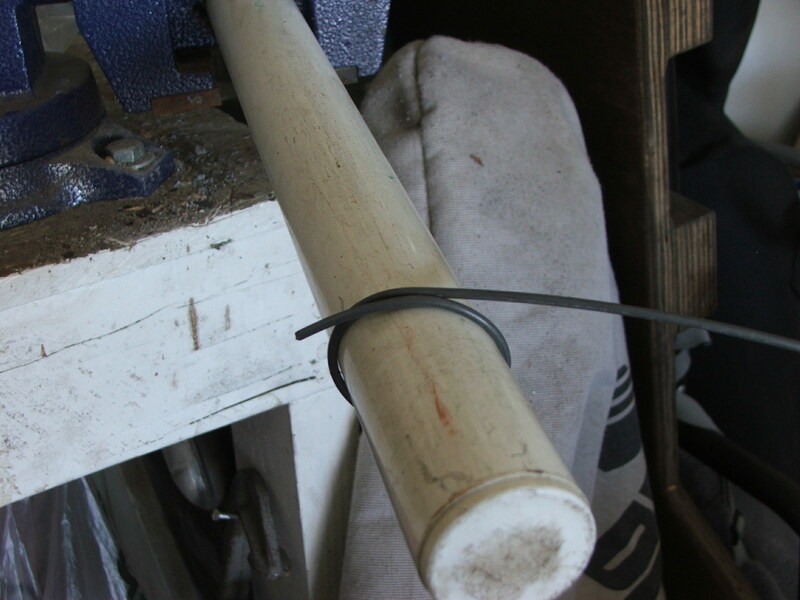 The material chosen will be used to completely wrap the trap ring from one of the twisted ends around to the other twisted end. Since I am making my dream catcher to be used as a good luck piece on my dream hunt, I am going to use artificial sinew. 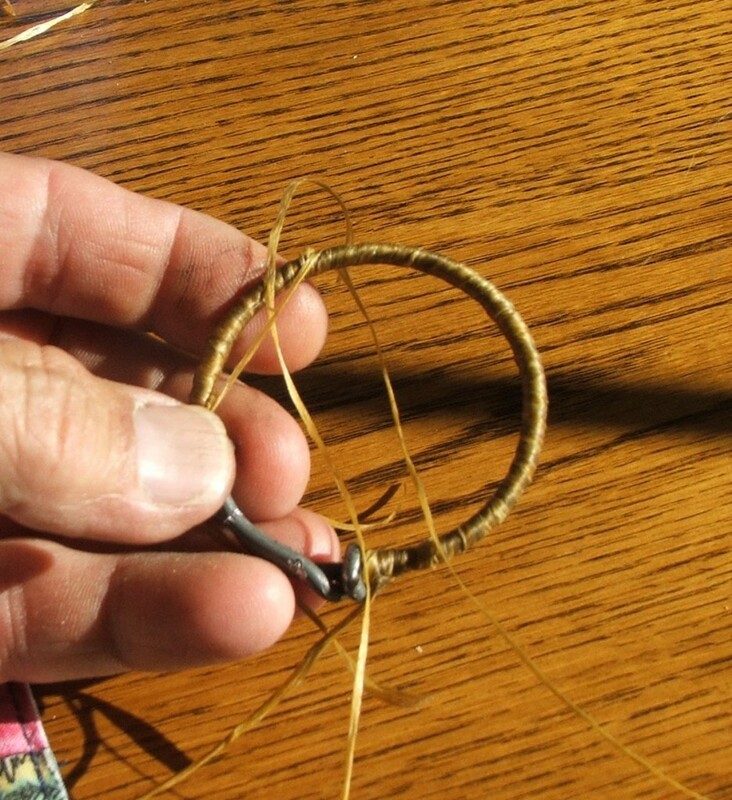 It comes in rolls like this, and costs about $9…there is a whole lot of sinew on that roll and it can be used for a bunch of stuff besides making dream catchers. Oh ya. The picture reminds me, we will need a pair of good sharp scissors too. Unwrap a piece of sinew, string or whathaveyou about four (4) times the distance around your trap ring. I say this because you might be making a dream catcher that is made out of an old wooden tire ring, the kind that was used on buggies from the past. Or you might be making a dream catcher out of a basketball hoop. So, about 4 times the distance around your ring. Longer is better than shorter, but you could still tie onto a short one to make it big enough. And learn how to tie a square knot. They are really easy. 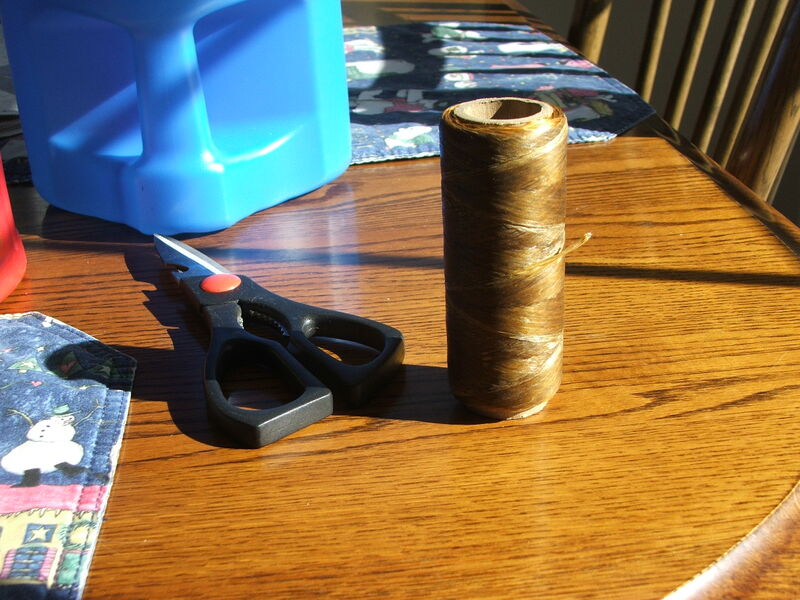 Now, let’s wrap the sinew around the ring. 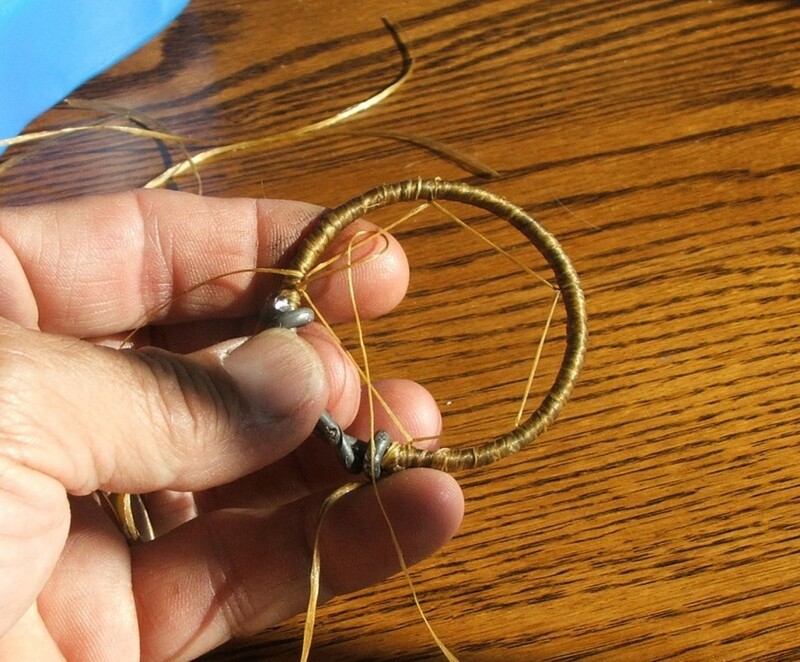 Keep the wraps close and maybe even overlapping. 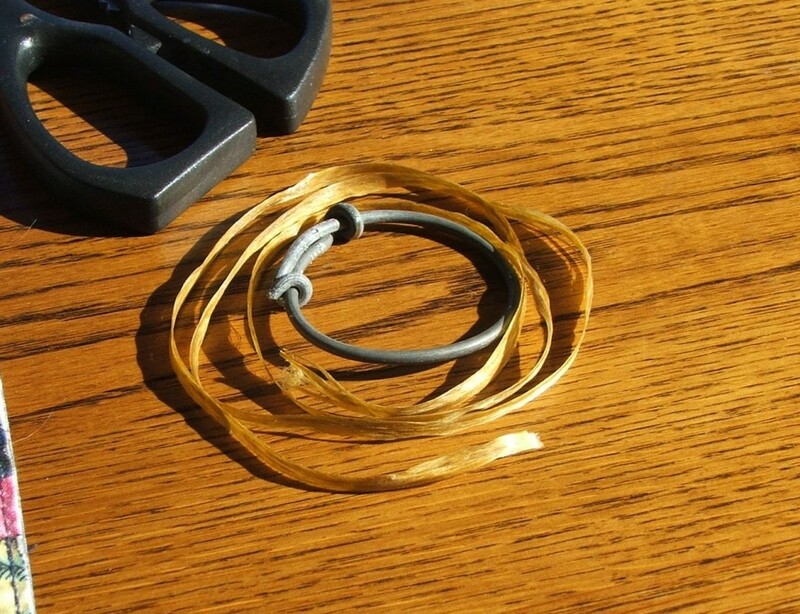 You want to completely cover any of the metal of the ring with this wrap. Now, finish it by tying it off using a half hitch. I like to use two half hitches, that way it won’t come apart. 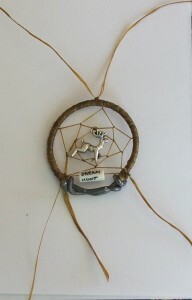 The next step is to make our dream catcher. 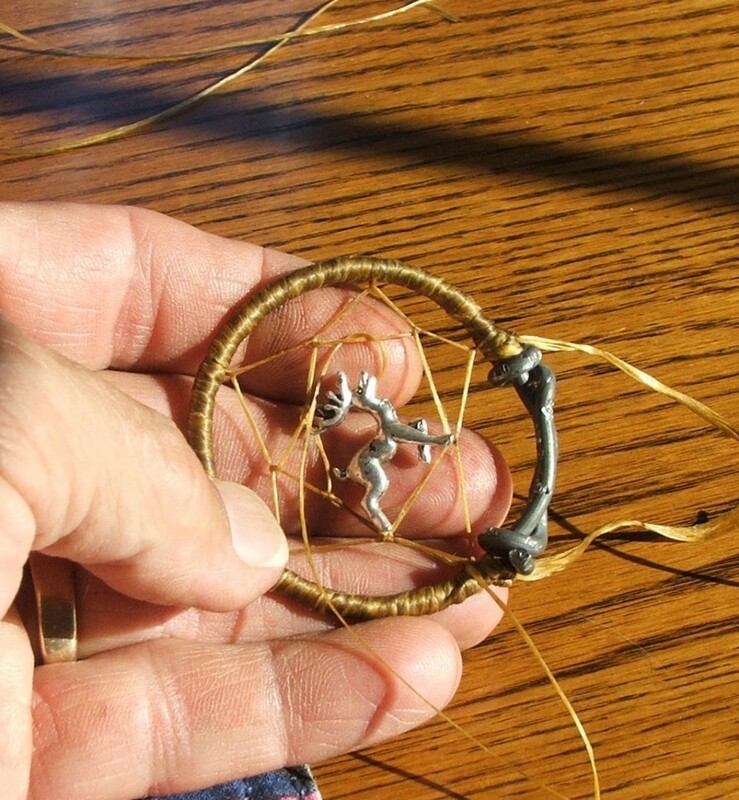 A dream catcher is actually a symbol of a spider web. Spiders spin their webs with sticky stringy stuff they produce in their bodies and when a bug flies into it the sticky stuff holds them there until the spider has time to come over and eat it. 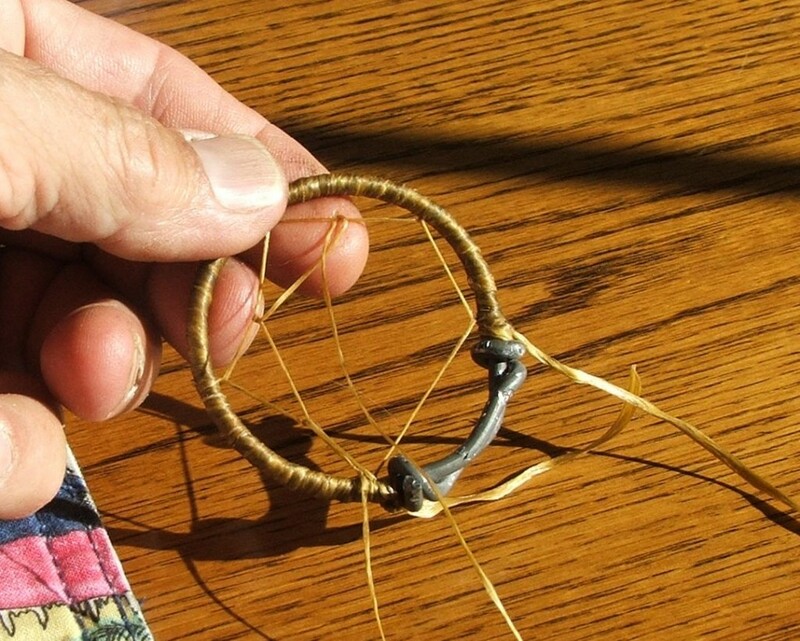 Dream catchers work pretty much the same way, only we don’t use sticky string to make them….well…you might use sticky string to make yours, but I won’t use it to make mine. 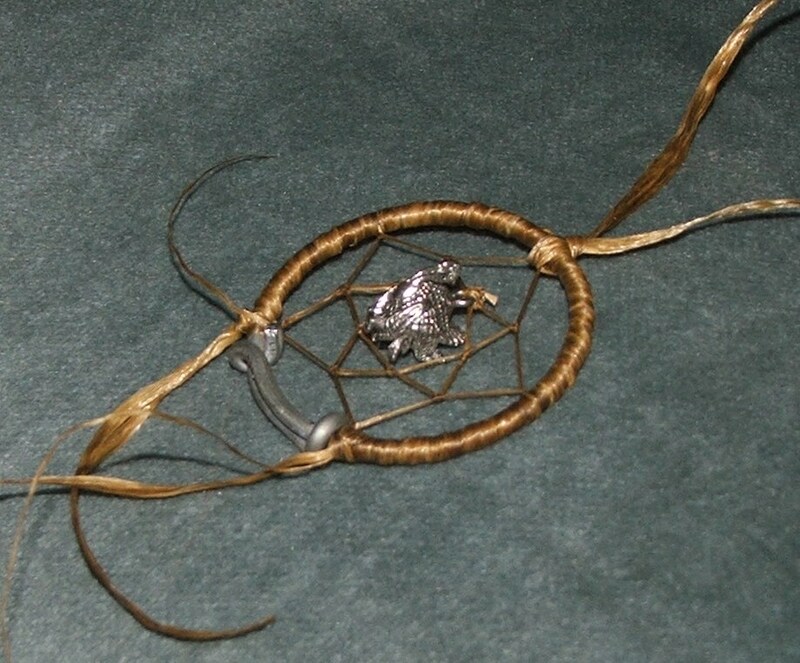 The thing about dream catchers is you put them over your bed and when you are sleeping the good stuff you dream about gets caught up in the web of your dream catcher and brings your good fortune and lots of good luck. 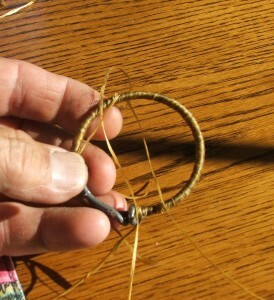 Since I am using sinew as my main string source, I need to pull my sinew apart in long strands. 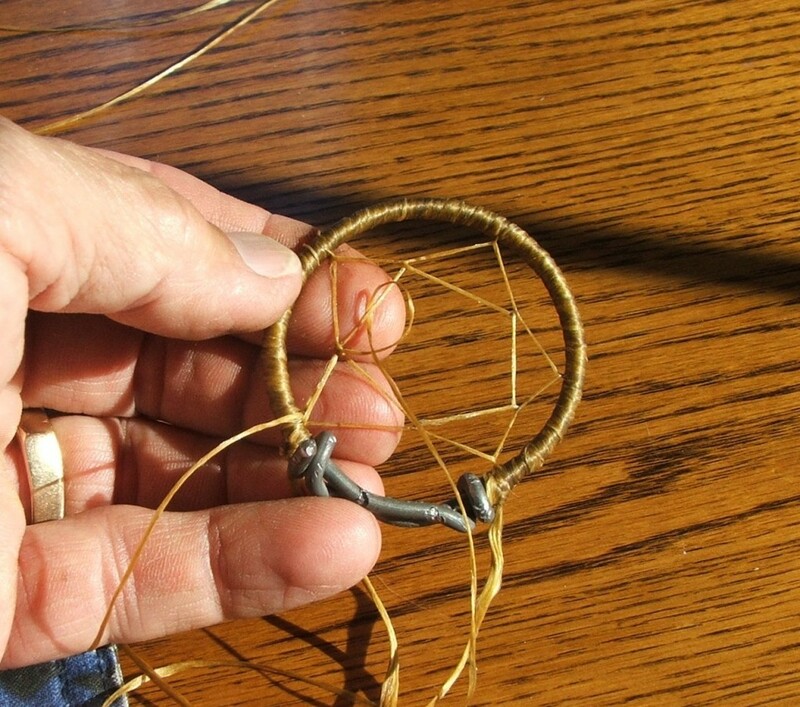 You don’t need thick string to make the “web” part of the dream catcher. 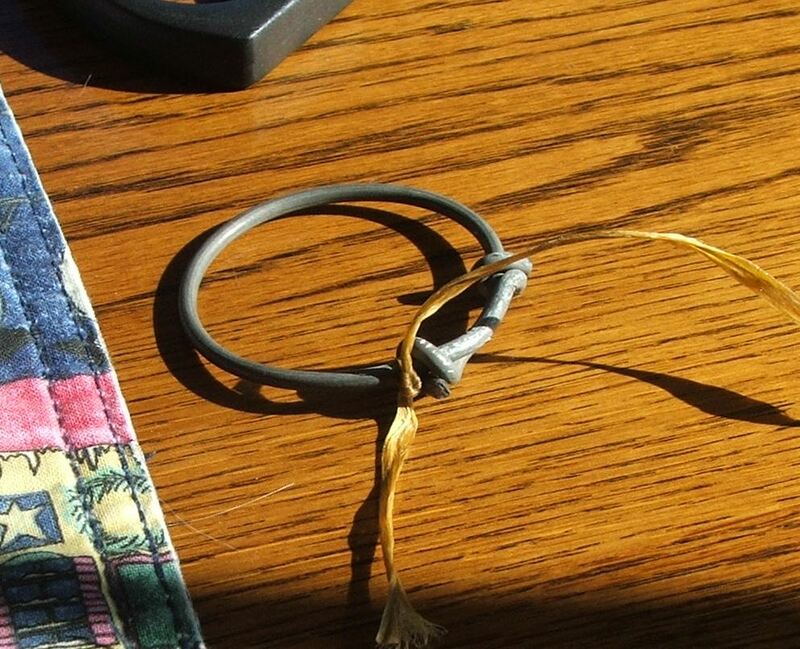 You might want to use kite string, fishing line or some other sort of smallish string. 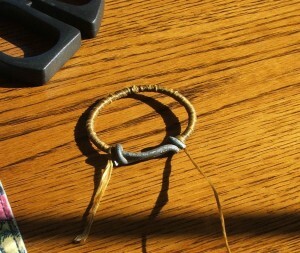 The length of the string needs to be very close to the length used to wrap your ring. 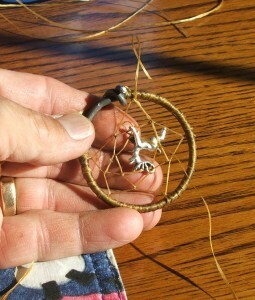 Any extra will be left hanging from the dream catcher for fun, or to tie something onto, like a feather or bead. 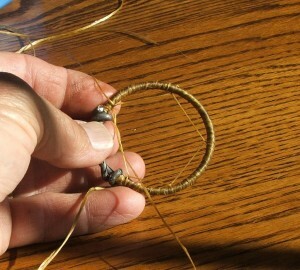 Tie one end of your string very close to one of the ends on the trap ring. Leave a couple of inches of your string hanging down. What knot did you use? Square knot I hope. Otherwise “tie alot”. Ok, here is where it gets creative. 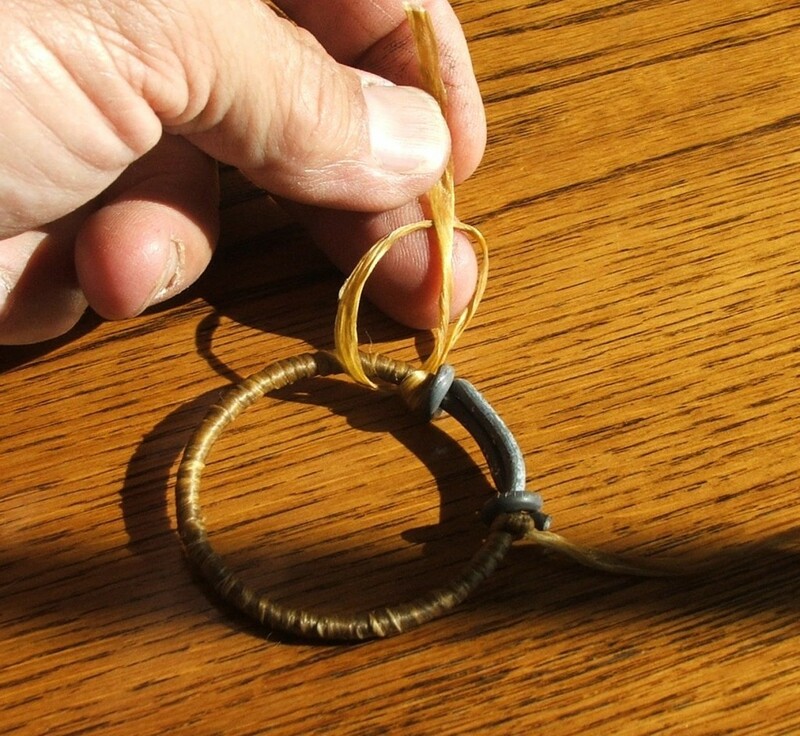 There is no absolute place you are going to tie your string next, but what you will do is pull your string to “some point” up the ring and wrap it around the ring and pull it tight. 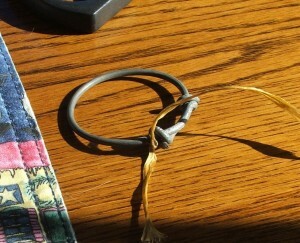 I am going to go about 1/3rd of the way up the ring and tie it there. 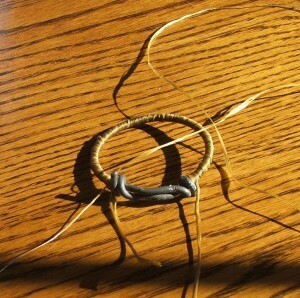 When I do, I will wrap the string around the ring, and have it come over the left side of the string. Look closely at this next picture for what I mean. 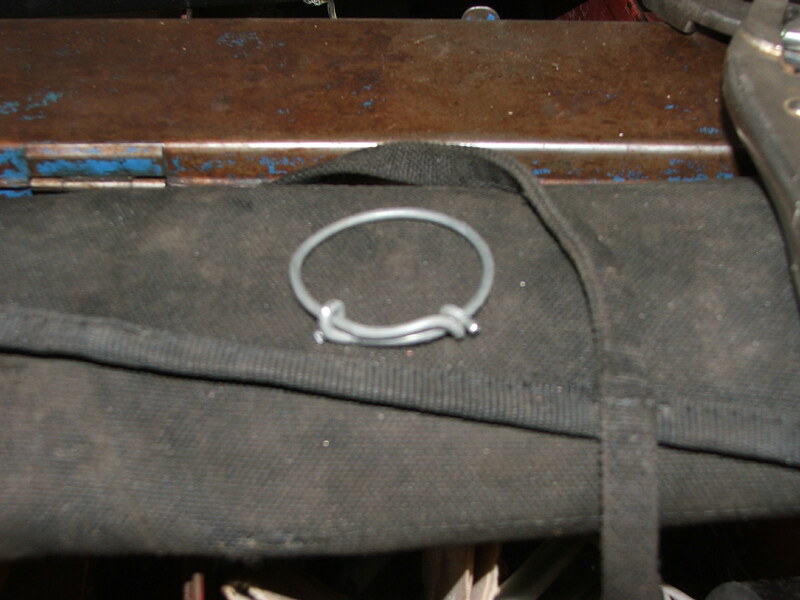 It’s not entirely clear to see what I have done here as the loose end of the string is hidden behind the trap ring in this picture. 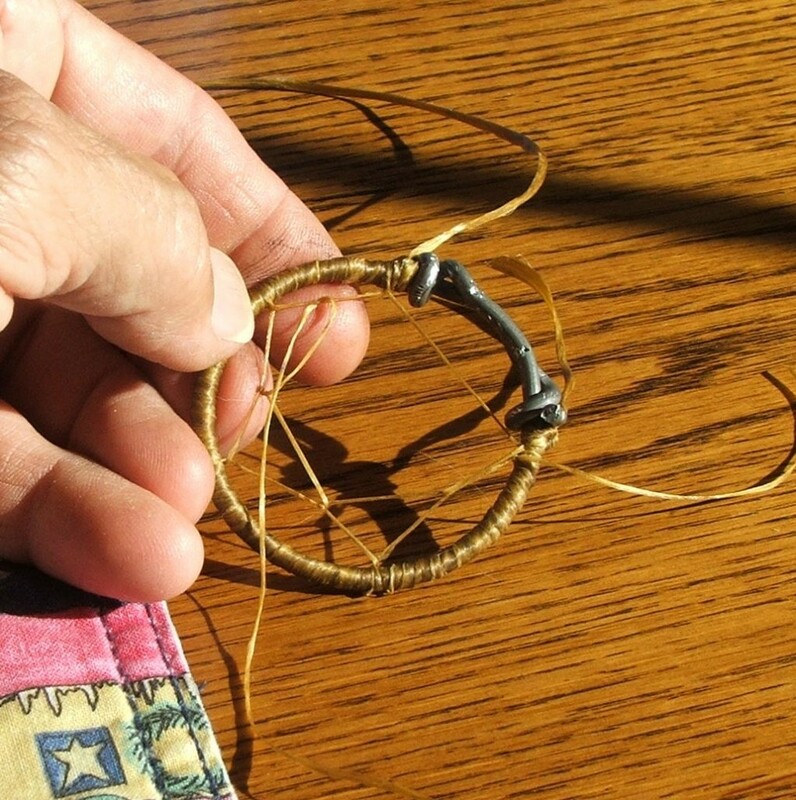 But what needs to happen is when we go to our next spot to wrap our string, it needs to pull this wrap towards it and so that is why the loose string has to be on the left side of this wrap. All our wraps need to be this way. Maybe as we continue you will see a better example of what this looks like. Anyway, give this a try and see what becomes of it. You can always undo it and try again. So, our next move is to again go about 1/3rd the distance around the trap ring and wrap our string. Pull these babies tight. You might want to even double wrap them. Your choice. Go another 1/3rd the distance and do it again. 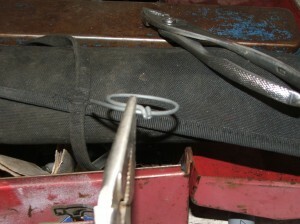 Pull tight and then go to the ring end and wrap it there. Pull tight and go to where you started with this whole deal. Look closely at the pattern you have going. Pretty cool huh? 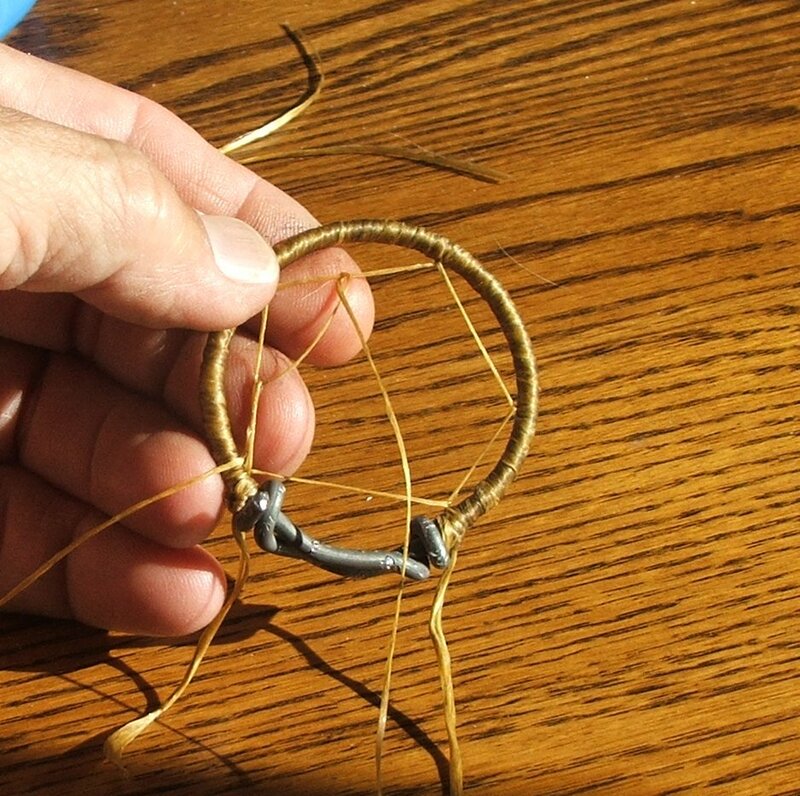 That is why I said you can make these dream catchers as fancy or simple as you want just by wrapping closer or farther apart. This next part is even funner. Our pattern is going to really start to take some shape as we go. It’s really easy isn’t it? 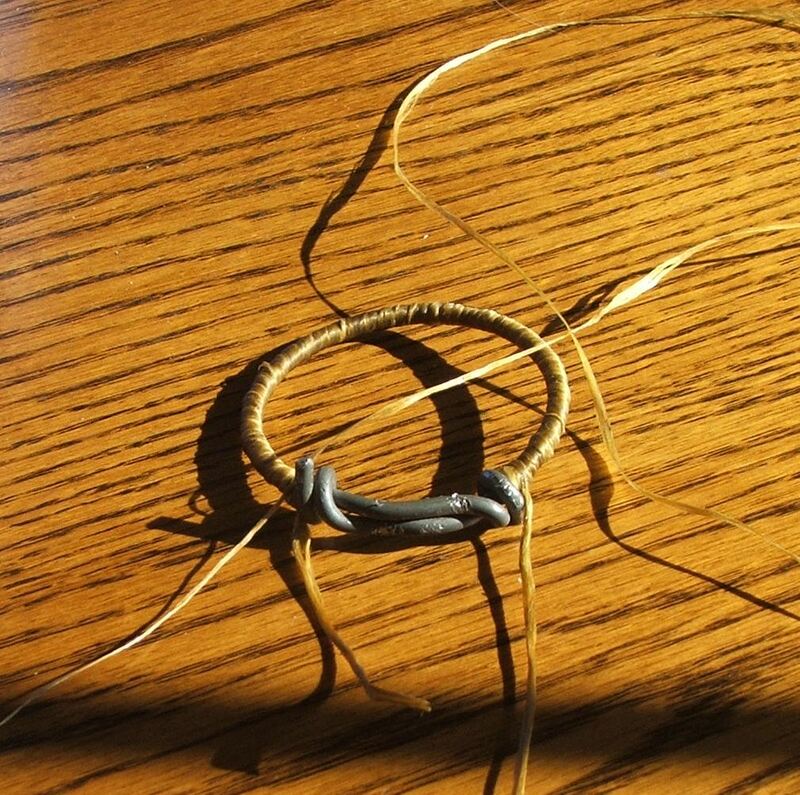 Now, take your string to the mid point of your first span of string. 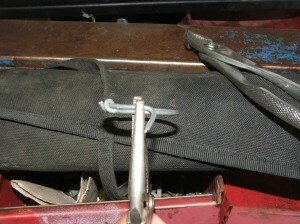 Pull this tight and go to the next span, again tie at the mid point. Pull tight, go to the next span. You still have mid points to go to…git er dun! Hey! This is lookin pretty good! But, for my dream catcher I need to introduce a little figure of a big buck. 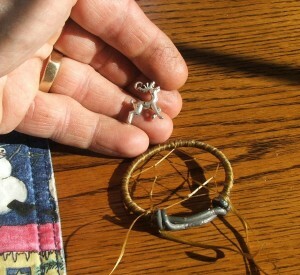 A charm of a buck. Check it out. This little baby is what my dream is all about. Catching a big old muley deer buck! 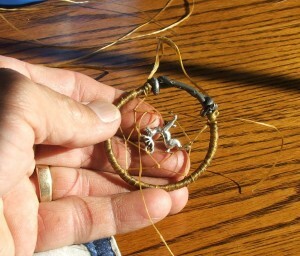 And so, what better to put in my dream catcher than one of these little babies? 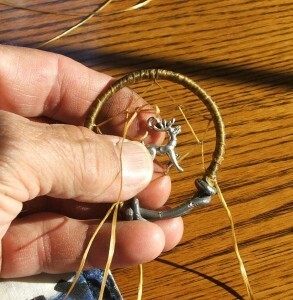 It has a loop hole on top of the antlers and I’ll be able to put my string right through that hole and tie it in the middle of my next span. This is getting more and more fun as it goes along. Pull tight and go to the next span! Pull tight, go to the next one. Pull tight and go baby go! Look closely, this loop is right under the deers front legs. 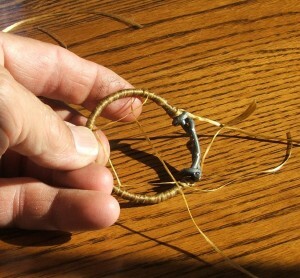 We now take our string over to the tie point under the deers back legs. Tie it there and then go down to the main trap ring and tie it off. 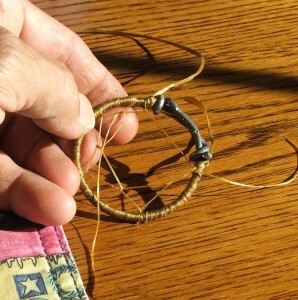 First we tie it off using itself and then double the tie using some of the loose string we left hanging when we started this process. You can cut this last string if you like or leave it dangling. Next cut another piece of sinew and tie it on the top of the dream catcher. 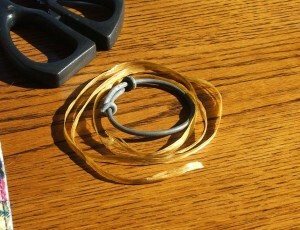 This string will allow you to tie it to your bed post, hang it from the wall or rear view mirror or to your beaversharn! Mine will be hanging from my beaversharn! You did a very good job at making this! I added a little bead on which I wrote “Dream Hunt” and put it where you see it using a separate piece of sinew. You can do whatever you like with yours. Get creative! It’s fun! And how much did it cost us? Hardly anything and who else has one just exactly like yours? No body! That’s who. Everyone of them is different, even though they might look the same at first. Enjoy! 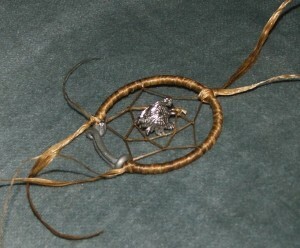 Now Go to Work Dream Catcher! Here is another I made up for the winners of the United Wildlife Cooperative youth turkey hunt in 2012….. I was on my porch the 20th of February drinking coffee when my neighbors cute little 8-year-old daughter came up to check on me. She said “It’s President’s Day!” She is really a smart kid. 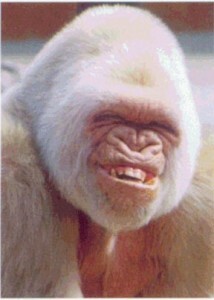 You know, it really hurts when hot coffee spurts out your nose.. Written on October 30th, 2011 , Jokes I like! Region Specific Items – to be presented in the specified region only. See attached tables for details. 1. We recommend adding a limited entry late any-weapon elk hunt on the Paunsaugunt Unit. hunt to avoid overlap with the rifle elk hunt. detailed hunt boundary is attached. 1. 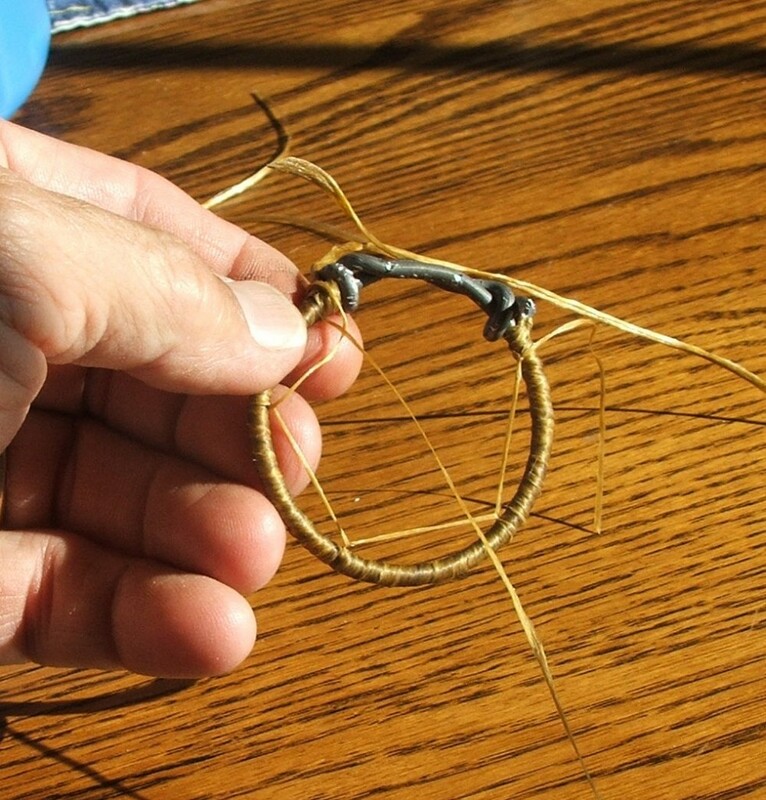 We recommend changing the Crawford Mountain portion of the Cache Unit to an any-bull elk unit. agricultural fields for forage. This change will help address depredation issues in the Cache Unit. to objective and reduce hunter crowding. depredation problems in that area. If anyone is interested I can give you the proposed hunting dates for each of the seasons in each of the 30 areas and be species specific if you want that info as well. This information comes from a very reliable source but I can not divulge the name unless he comes forward and says he doesn’t mind. I will not solicit that from him. The below link is about the name Wasatch, and how it came to be called that. And since I live at the foot of that mountain range “Wasatch Mountains” this was very interesting to me. WOW! Bob and I decided to hit the swamp for an afternoon of duck hunting yesterday. Oct. 25. There was a slight breeze blowing, partly cloudy skies and the temperature was a balmy 40 something. All in all, not a good day for duck hunting. Usually a good day for duck hunting is “fowl weather”, high winds, stormy, with rain, sleet, hail, snow…you know…Fowl! Well yesterday there were hundreds if not thousands of ducks flying everywhere. Mostly spoon bills, which is not one of my favorite ducks to be shot. They eat well, but still I’d rather have a limit of male mallards or a brace of Pin Tails with a mix of Gadwalls. After much frustration at seeing spoonies winging in from every direction we decided to take a couple. Once we broke the ice on them we went crazy with our shooting and ended up shooting 61 shells between the two of us! A day much similar to one I had with the Edjukateer, as far as fast shooting goes. In the end, we both got ourselves doubles (two shots, two ducks) and I did something I had never done before and that is get two ducks with one shot! Our decoy setup is usually a couple dozen duck decoys and a dozen goose decoys. The goose decoys are usually used as confidence decoys as the ducks seem to decoy better if they see the goose decoys. Geese tend to be more cautious in the real world and so if ducks see geese they will come into the set. Well, yesterday three honkers were passing by to our North quite a distance away, and suddenly decided our set of decoys looked pretty good. They turned and set their wings right into us! BANG! BANG! BANG! BANG! BANG! Two of the three were on the water and the third was wondering where is buddies went! 61 shots! 7 Spoon Bills, 3 Teal and 2 Honkers! Not a bad afternoon in the swamp. Left home at 2 p.m. and back home at 6 p.m. Thanks for going with me Bob! It was a wonderful time! Well, after two trips to check out the duck boat yesterday and only to have things not go as planned. Bob and I are heading out duck hunting with the atv today. The storm that is here should have a few ducks winging around and we hope to put a couple in the bag. Colmer Island is the place we plan on hunting. There were a lot of ducks milling around yesterday afternoon as we were messing with the boat and it looks like today might just be a great day in the marsh. Will post up pictures of a successful hunt. If you don’t see pictures, well…let’s just say we didn’t bag any birds! TThe blue line is Google searches over time that had the word Facebook in the search phrase, while the red line indicates the word Twitter in the phrase. Interesting. The following story happened to me about 20 years ago, or so. It was a cool Fall morning and my brother Bob and I were out duck hunting. It was still way to dark to be able to shoot and we were bailing out the water from a sunken box blind. 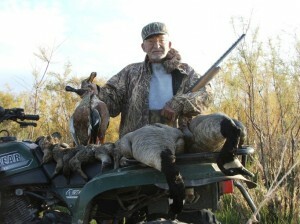 I had set the decoys out, while Bob started to bail. When I was done, I came back to relieve him of that task. As he was deciding whether to finish the job or turn it over to me, I was looking up at all the duck silhouettes passing over our heads. Hundreds and maybe thousands of ducks were coming off the water in the shallows and flying back to Unit 5 of the Bear River Bird Refuge. Their flight path took them directly over us. It was a very cool sight to behold. It was still too dark to identify what kind of ducks they were, just duck silhouettes passing over head about 30 to 50 feet up. Lots of quacking and whistling of wings as they went. Flock after flock after flock. I made a comment to Bob about it and he took a second to look up and see what I was seeing. During those days, I wore glasses in order to see distance. Without them, I could not have seen the first of those ducks. Blind as a bat at noon I was without my glasses. As Bob was looking up, so was I and as quickly as not, a LARGE amount of duck crap hit me right between the eyes! SPLAT!!!! It covered both my glass lenses and of course my forhead and nose and cheeks! YUK! I told BOB the season for the day had started! Let’s kill us some ducks! He laughed for quite a long time when all that happened!